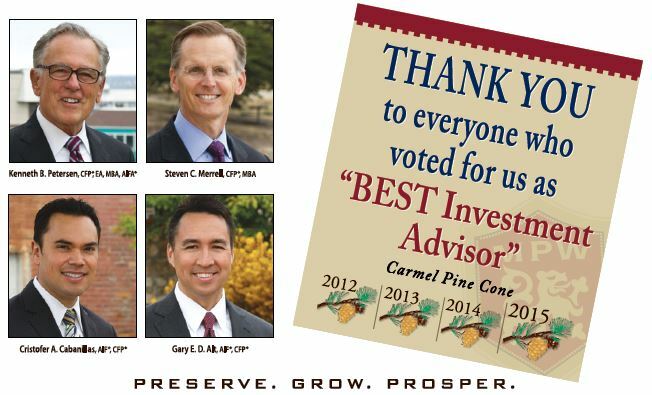 In the 2015 annual Golden Pine Cone survey, Monterey Private Wealth was voted “Best Investment Advisor” for the fourth year in a row by readers of The Carmel Pine Cone weekly newspaper. We appreciate all of those who voted for us! One of our goals is to be recognized as the most highly respected investment advisory firm in Monterey County and the East Bay area. We are honored by the Golden Pine Cone recognition, and we appreciate the opportunity to serve the people in those communities and our clients. Click here to view the Golden Pine Cone publication on The Carmel Pine Cone's website. Monterey Private Wealth provides financial planning and wealth management services for private individuals and investment advisory service for small business 401(k)s. It has offices in Monterey and Pleasanton, CA and provides financial services in Monterey, Carmel, Big Sur, Salinas, Marina, Santa Cruz, Gilroy, San Jose, Pleasanton, Dublin, San Ramon, Danville, Blackhawk and Livermore and surrounding areas. Important: Rankings and/or recognition by unaffiliated rating services and/or publications should not be construed by a client or prospective client as a guarantee that he/she will experience a certain level of results if Monterey Private Wealth, Inc. is engaged, or continues to be engaged, to provide investment advisory services, nor should it be construed as a current or past endorsement of Monterey Private Wealth, Inc. by any of its clients. Rankings published by magazines, and others, generally base their selections exclusively on information prepared and/or submitted by the recognized adviser. Please view our full disclosure here.